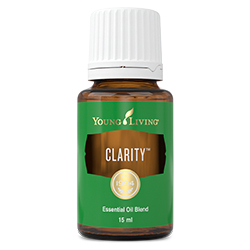 Clarity™ contains Basil, Rosemary, and Peppermint essential oils to promote a clarity of thoughts. Use this rich blend to provide greater mental concentration and alertness, improvement of concentration, emotional balance, and to overcome mental fatigue. Clarity may help to overcome change and embrace learning on a new level, whether learning new things or processing new information, changing habitual patterns, or overcoming distraction or procrastination. Use this stimulating essential oil blend during meditation to help remove mental and emotional obstacles, and allow for deeper insight. Diffuse Clarity when feeling confused or conflicted over a difficult decision to inspire mental clarity and greater focus. Apply to ears, wrists, neck, forehead, or feet to instigate feelings of alertness, focus, and vigilance. Basil (Ocimum basilicum) oil †, Cardamom (Elettaria cardamomum) seed oil †, Rosemary (Rosmarinus officinalis) leaf oil †, Peppermint (Mentha piperita) oil †, Coriander (Coriandrum sativum) seed oil †, Geranium (Pelargonium graveolens) flower oil †, Furanocoumarin-Free bergamot (Citrus aurantium bergamia) peel oil †, Lemon (Citrus limon) peel oil †, Ylang ylang (Cananga odorata) flower oil †, Jasmine (Jasminum officinale) oil**, Roman Chamomile (Chamaemelum nobile) flower oil †, and Palmarosa (Cymbopogon martini) oil †.